If you want to achieve more, you need to associate with those who are more successful than those whom you share your goals and dreams with are ones that can help you see the path toward success. Do not hang with people who belittle your vision. I once heard Debra Jones, an accomplished professional speaker, proclaim "If you are the most successful person in your circle of friends....YOU NEED NEW FRIENDS!" She was not suggesting that you should leave the cool people in your life behind just because of the size of their bank account, nor should you only select people as friends because they are rich....but she was making it very clear that you need individuals in your life that challenge you to go farther than you have before. There is an old saying "If you want to soar with eagles, don't hang out with chickens!" Achievers motivate you not just by their accomplishments, but someone who is truly successful....emotionally, spiritually and financially,.... will never discourage your goals. Instead they look for ways to assist others in achieving greatness. Everyone should have friends in their life who enthusiastically support your efforts toward success. To find this kind of person you need to go out an look for them. You will tell a lot of people about your dreams, which will lead to many whom will discredit your aspirations. Have a thick skin and do not become discouraged by those who do not welcome your efforts or try to knock you down. Keep going, and you will discover the really amazing people who are part of your destiny. I know, I have friends like this. I feel that I have to pinch myself to prove I am awake, as it sometimes seems like a dream to have people helping me along my journey toward success. But I also have encountered many naysayers. There are always those who appear to be friends, who disappoint. Oh, and there are those who actively attempt to undermine. Life is not easy, and there is no magic wand that can help you avoid these negative beings. But don't let the bad guys get you down. Just one supportive person can change your whole future. Keep your eyes open of those people who will help raise you up, and the sky is the limit! The kids did not know that we were going to the circus last night. We surprised them. Being a kid and finding out that you are going to the circus in ten minutes is a pretty big deal. Smiles, giggles, anticipation. Pure joy! And yes, it was The Greatest Show on Earth!!! The Ringling Bros. & Barnum Bailey Circus has come a long way in thirty years since my cousin and her husband, Patrick and Eileen McDermott, took me to see the show (I don't know that I ever properly said "Thank You" to them... I mean, come-on, I was twelve...but I always have remembered that night!!!). The success of this circus is in their ability to morph with the times. This was not the "three ring circus" of yesterday, in fact, there was no rings at all. The show was a multi-media experience and the action never stopped. Remember the cliche of "Circus Freaks"???? No more, the clowns all looked like kids who grew up and left the skate park to join the circus. The were not the fat, old, prat falling clowns that I recall. These were cool and hip acrobats in face paint. Oh yes, and they how have hot young women dancers who work with the clowns to keep the crowd engaged (like cheerleaders with elephants). How many businesses can continue to grow and thrive for over 135 years and still be relevant? Many can't remain relevant with their audience for five years! How about you? Is your business able to change with the times and re-invent your show? Or do you just keep doing everything the same way? Law firms, banks, accountants and others seem to try to avoid change. Those that are thriving are the ones who embrace the new world and focus on how to make their business The Greatest Show on Earth! Take some time today to examine how your company is like the circus. Do you leave your audience saying "Wow". If not, why not? When I asked my ten year old what was her favorite part of the circus, she immediately knew it was the white tigers and the motorcycles (how seven motorcycles can all ride at full speed in a big metal ball without an accident was amazing). As their target market, my kids were engaged and could instantly repeat what made the circus great. If I asked your clients what makes your product of service "great"...would they know? Help others to help yourself. To succeed in business you need to develop a habit of discovering how you can bring value to other people. One of the best ways that you can become a a valuable resource is to become a connector. As you begin to grow your network of personal and professional contacts, opportunities will materialize where you can introduce people to do business together. When you see a possible link, do not hesitate, connect the dots....even if there is not a direct "pay-off" to you! Many people over analyze the thought of introducing people in their networks. They either believe that they are imposing on their friends, or they pre-judge the importance of the connection. When you do these things you will fail to follow through, and thus the possibilities are lost to everyone. The right thing is to put them together and then step out of the way. This does not mean that everyone you connect will lead to a business deal, but sometimes they will. I have never met anyone who was not happy for an mutually beneficial introduction. A childhood friend recently called to say her family was moving across the country to take a new job in the city where I live. They were coming for a house hunting trip, and mentioned that they were not happy with the relocation realtor that her company had provided. I immediately told her that I was a close friend of Chad Goldwasser, one of the top real estate agents in Austin, Texas. Chad's company, The Goldwasser Team, is a national leader in the Keller Williams organization. She decided to make the change, and Chad and his buyers agent took over the quest to find the perfect home. Alas, she was thrilled with the customer service and personal attention that her family received from The Goldwasser Team, and purchased a wonderful new home. Everyone wins when you make a connection. Sure, I could have said nothing when she was lamenting about her house hunting dilemma....but because I spoke up she has her dream house, and Chad has a happy customer. You need to look for ways to be a connector and then take the appropriate action to facilitate introductions. Some might argue that it takes too much time to do such things when there is no direct pay-off. I cry fowl at that. If you think that direct compensation is necessary for every action you take, then you are a selfish person. Instead, find ways to help other, and you will be surprised by the indirect ways that you are rewarded throughout your lifetime. What goes around comes around! The cover story of the July 2007 Business 2.o Magazine is "The 50 Who Matter Now", a list of the top 50 most influential people in the technology world (okay, some are companies or industries, as ever since Time Magazine named "You" the person of the year, such generalizations are all the rage). And lets face it, those who matter in tech matter to all of us. As I read through this conglomeration of important names (some whom I had heard of - others I had not) I kept pondering how cool it would be to be in the same room with all these folks. It would be the networking event to end all networking events. The term "Power Networking" would show this party as an example on the web pages of Jimmy Wales' (number thirteen) Wikipedia. Imagine for a moment finding yourself as the 51st person in the room of a classic grand old hotel ball room, having the chance to network with those who are changing the future over wine, cheese and some fancy salmon dinner. What would you ask Steve Jobs (number two) or Fake Steve Jobs (number thirty-seven)? Would your conversation with Richard Branson (number thirty-three) warrant his sending you a handwritten follow up note? Could you and Jeff Bezos (number twelve) develop a mutually beneficial friendship that would lead to future business opportunities? Or would he at least send you a free Amazon.com gift certificate? This fictional, yet amazing, dinner party would in itself change the world, as I believe that when true visionaries are put together, anything can happen (and usually does). 7. Susan Decker, Executive vice president, Yahoo! So if you and I cannot get invited to this party, we need to be on the look out for others who have the vision and the ability to influence change or to do it ourselves. Seek out dynamic people and learn from them. Help them achieve their ideas that are transforming the world of business, and share in the glory of accomplishment. One side note, as the father of two highly spirited daughters, I am sad to see so few women on this list of those who inspire and motivate. By the time my kids are grown, I hope that that will have changed!!! At Starbucks this morning the bartista was telling everyone to have a "Happy Sunday" as she gave them their morning lattes (it is Saturday). When we pointed this out to her she gasped in horror, as she had been saying this all day. She had visions of ruining the weekend for dozens of people who feared their life is already going past too quickly. While I knew it was Saturday, it did make me think about how fast the weekends speed past. I blink and I am back at work on Monday morning. Fortunately I like my job and the people with whom I work, so there is no trepidation in the work week. However, I remember when I was a kid in the 1970's and the early days of the technology revolution. There were those who predicted that computers would make us so efficient that four day work weeks would become common, and leasure time would become pleantiful. Leasure time? What is that? Tech gadgets have done just the opposite and have chained us to the office. I remember having a pager 15 years ago and calling it "my electronic leash". My boss could call and leave me a number, and then I would need to find a phone and call him back. How elementary. Now I have a cell phone, a blackberry and all kinds of other technology that allows me to be in constant contact with my job no matter what I am doing or where I am in the world. I can be reached by anyone at anytime. Paris? Dublin? No problem. Blackberry and phone work just fine. Few places on the planet allow us to be totally free. Sure, we can leave the devices at home, but then guilt works it's magic. So as time swooshes past us, we continue to find ways to eliminate free time. Tim Sanders has a challenge on his blog this week that encourages bosses not to email their people over the weekend. While a good idea in theory, I don't see it cathing on. Oh, gotta go, I have a call. I am amazed at how judgemental people are about attending networking groups or other business events. They attend one time and make an instant decision that there are not the "right" people participating. They never go back and forever hold onto that one impression. I think this is a common mistake that professionals make in regards to networking: they draw conclusions too fast and judge the value of specific people and organizations. First, lets be clear. Some groups are not a fit for you because their mission and purpose are not aligned with your needs. That is okay. If you end up at an event like this by accident, do not feel you are wasting your time, instead, embrace the opportunity to meet diverse people from those you normally hang around. You do not need to attend again, but discover the serendipity of being present and make your experience worthwhile. Remember, you never know who you might meet who could lead you to future opportunities. I attend a lot of networking events. I enjoy being around people and always find positive connections. There are so many business gatherings that nobody can attend them all, so I am not suggesting that you have to be "everywhere". However, you should be actively involved in your business community, which means you will regularly have to explore a variety of gatherings. Do so with an open mind. When others are actively engaged with an organization, and you do not see the value in attending, ask them why they are involved. Assuming that your impression is the only point of view is not going to help you to grow and expand your network. Curiosity and acceptance will take you a long way. I often attend a business group that is mostly attended by bankers, lawyers, accountants and other service providers. Many in town discredit the value of attending this group's events, since few actual corporate prospects are in the room. However, networking and building strong relationships with the key service professionals can lead to referrals to the prospective companies that I desire to know. I often get direct referrals or whispers of information from people I see at this luncheon. Not showing up at all allows your competition to become the contact in your industry for all those very well networked service professionals. Ouch. Many rationalize that being in the office and working is always more important than attending a networking event. It makes them feel productive, and they falsely think that being out at an event is just for fun. Let me tell you, networking is work, not "fun" (although it can be fun, too). You have to make an effort to build real connections with people. However, since it is from other people that we discover opportunities, if you are not expanding your circle of connections, you are leaving money on the table. Ouch. Instead of looking for reasons to discredit networking events, a successful person will look for the good in every chance to meet someone new. Me thinketh folks protest too much about networking. A post I wrote in April was picked up by BuzzFeed, and my traffic has gone wild today. While I do not write a politically focused blog, the post was about Arianna Huffington, from an article I read in Selling Power Magazine. Welcome to anyone who is visiting The Some Assembly Required Blog for the first time from that link. Anyone who has ever seen me speak knows that I am a big believer in taking the time to send a handwritten note. This should be done when you first meet someone whom you want to get to know better, or as a "thank you" when someone in your network improves your life in some manner. While delivering a presentation to a room of 200 technology professionals, a woman raised her hand when I spoke about the power of the handwritten note. She said (and I am not making this up) "My clients work in the technology world, and they only like email. To send an handwritten note would send a message that I am my own grandmother. Nobody in tech likes personal notes. In fact...I think it offends people". Wowwy. She was as passionate about anti-handwritten correspondence as anyone I had ever met. I just stood there in silence for a few seconds. The response I wanted to give was "OHHHHH PLEEEAASSSSSEEEEEE... Get over yourself" (but that would have been rude). I did argue with her, stating that I was sure she was wrong, that a handwritten thank-you note would never be considered offensive by anyone, and would actually stand out from the hundreds of emails that are received daily by most executives. I have thought a lot about this exchange over the past few months. What this woman failed to recognize is that doing something "cool" and "memorable" is not about doing the same thing as everyone else. If everyone in her industry (aka: her competition) only correspond by email, then an occasional note card will make her special. What makes things "cool" is just the fact that they are not the norm. I was not suggesting that she only contact people in this manner (and I did not say to send the letters by Pony Express). Email is a useful tool for all kinds of interactions. Yet for following up on a first time meeting or to say "Thanks", it will go a lot farther if you invest the time to put it in writing. Go ahead, try it. Send a handwritten note to someone. Be cool. The Central Texas Chapter of The Association For Corporate Growth(ACG) is amongst the premier business groups in Austin. 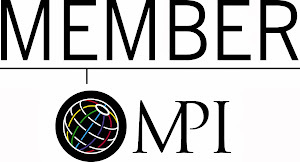 The organization has grown membership, attendance and the quality of speakers over the past few years. Their monthly luncheons attract executives and other professionals of local companies for educational and networking opportunities. This week the ACG held the local 2007 Annual ACG Growth Awards, which are part of the ACG's international program. The ACG International Corporate Growth and Emerging Growth Awards recognize excellence in sustained growth and financial performance in companies in three categories: revenues up to $25 million, revenues between $25 - 100 million, and revenues over $100 million. All these are great local companies who are continuing to excel and impact the local economy. There were three finalists in each category and all deserved the recognition, as everyone on the short list is a stellar performer. More information about ACG is available at http://www.acg.org/. Regardless of where you live, you should investigate your local ACG chapter....as you will find it to be a great resource. I have a friend who is just starting to write a book. His career has been a skyrocketing success and his passion to help others achieve greatness has become evident. He is scheduling meetings with everyone he knows who has undertaken a book project and discovering the best practices to make his dream a reality. He is devouring the advice and finding which path to take in creating his future New York Times Bestseller . He is a perfect role model to those who want to expand their paradigms. By talking with those who have completed the goal that he desires, he is proving to himself that this is attainable. Additionally he is finding a variety of ways to work on his project, using the best techniques of each of the other authors. We had breakfast together earlier this week, and his enthusiasm is contagious. I enjoyed telling him about how I wrote my books, ....the experience of working with my editor, ....and the nitty gritty of marketing the finished book. Our conversation was motivational for us both. If you have a big goal, seek out those who have completed the journey and seek their knowledge. Ask the experts!!! Entrepreneurs, lawyers, bankers, and other business professionals should not wait until they need to make an important presentation to investors, clients, board members, employees or buyers to begin to fine tune their presentation skills. Delivering a good presentation is too important to your career to be left to chance. 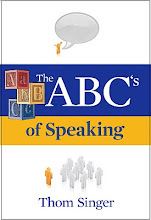 Speaking skills should be cultivated from the beginning. We have all sat through presentations that were painful to the audience, while the speaker just drones on without ever getting to the point. Your weak presentation skills will always be remembered by those who were subjected to your pontifications. Toastmasters is a great organization to help anyone become more comfortable with public speaking. While it is a time commitment, I suggest that everyone join a Toastmasters Club and actively participate WEEKLY for two years. At the end of this time they will have the skills to navigate any speaking situation more effectively. While most busy professionals claim they do not have extra time....this is an investment in the future. An investment that will pay incredible dividends. Through active participation in Toastmasters you will learn valuable tips on presentation preparation, use of vocal variety, gestures, visual aids, appearance, and language. All of these together will lead you toward better success. Those who are known as great orators are often called upon to speak at conferences, seminars and other business events. Being on panels or teaching courses at these types of gatherings positions you as the expert in your industry. As the expert, you will be able to meet more people and attract more opportunities. When developing your networking skills, do not ignore your speaking skills. Vickie Sullivan is a grand oracle of the speaking business. I love her newsletter, as it is always interesting and has useful advice for speakers, trainers, authors and others who take the stage. This week she talked about the changes that are happening to the organization of meetings and seminars. I have heard a lot about the concept of the "unconference"....where there is not a formal agenda, and audience helps drive the content on the fly, rather than having the whole thing scripted in advance by a meeting planner or committee. I have yet to attend one of these events (I hear they are all the rage in the technology industry in Silicon Valley), but look forward to seeing one in action. "On the top of the list is the "unconference" concept, which features, among other things, spontaneous content designed by the attendees. Let's all take a breath here - this development doesn't point to the end of speakers as we know it. Don't think for a minute that buyers are going to risk losing attendance by not inviting the gurus. What it really means: gurus get grilled by the audience, instead of controlling their environment with prepackaged content. And that's a good thing for facilitators and other group dynamic experts. This is a skill every expert needs to have". I love delivering truly interactive presentations. I prioritize getting the audience actively involved when I speak, as it makes it much more fun for the attendees and the speaker. Some want to make sure that they are in total control when they are on stage... but giving a professional talk is the same as starring in a one man show on Broadway. Instead it should be a give and take exchange with everyone in the room. However, sometimes the audience is not prepared to jump in and "grill" the speaker....even during scheduled Q&A...they just sit there. This is less fun for everyone. The active exchange of thoughts and ideas is paramount to learning, plus it facilitates the building of community. To have a guru spitting words from the podium does not build a network for the speaker or his/her audience. Having a conversation is what advances relationships. I think the "Unconference" is great. Infact, I think that I am going to make one happen for the Bootstrap-Austin Publishing Subgroup later this summer. Many people believe that you either "cold call" or you "network", however, these are not business practices that are in competition with each other. Instead they are complimentary. business...it makes your cold calling efforts less painful. No sales professional enjoys picking up the phone and calling potential clients. Trying to schedule an appointment with busy professionals can be a struggle. Voicemail and gatekeepers have made cold calling next to impossible. To succeed you need to stand out from the dozens of other solicitors who ring in daily. Your network helps not just for the obvious fact that you can make more "warm" calls when a mutual friend allows you to use their name in your calling. If you know a lot of people in your business community and keep up with the local news (and other happenings that are topical to the person you are calling), when you do have to make a COLD call.....it is more likely that you will quickly find some common connection to the person you are calling. The sooner you find a connection, the faster you call will heat up!!! Being a dad is a great joy, but also an overwhelming responsibility. I look at my two daughters and pray that they grow up emotionally strong, and equiped to make the tough choices that we all face in life. I work long hours, and often worry that I am not having the impact that I desire. They are amazing little people.....and I don't just love them, I like them. I also have big shoes to fill, as I have a fantastic father. I know that many people grow up hoping NOT to be like their parents....but I aspire to be like my dad. I only have positive memories of growing up in his home, and love to bring my kids to visit him every summer...so they can know him. He was older when I was born, almost 52-years-old, but that did not slow him down from being a hands on influence on my life. Maybe more so, since he retired when I was in the 8th grade, and thus he was always around during my high school years (at the time it seemed like he was around too much!!!). He will turn 93-years-old this year, and I cherish every moment with him (although those moments are rare, since I live 2000 miles away). I had the opportunity to have a conversation recently with Wall Street Journal "Work & Family" writer Sue Shellenbarger, who was working on an article on fathers, and how they influence their children. It was fun to be quoted in the Wall Street Journal, but beyond that, her article really hit home for me about the important role I play in the lives of my two kids. Dad's are different from Moms, and that is okay. It is that unique style of interaction that does impact the children. CLICK HERE to read Ms. Shellenbarger's article which appeared in Thursday's Wall Street Journal. I would like to take a moment to wish dad's everywhere a Happy Father's Day. We are late with the June Carnival of Networking. Sorry, I deleated about 10 submissions that had nothing to do with the topic of networking. It is just crazy what people who use Blog Carnival will submit! Short list this time. But all are good. Michelle Cramer sends us "Buddy Networking"
Scott Allen sends us "Smart Ways To Use LinkedIn"
Michell Cramer sends us "Rules for Networking on MySpace"
I need someone to host the August Networking Carnival, as we will be taking July off since the June responses were low on usable material. Let me know if you would like to take on the August edition. Since starting "The 66 Tips To Better Networking" a few weeks ago, I have stumbled onto something. I have received more emails about this series of posts than anything else I have ever written on The Some Assembly Required Blog. Hells Bells, I am only on number nine!!! So the Sixty-Six is becoming something...although we don't know what. As a reader and member of the Some Assembly Required community, I welcome your input into this project. As it morphs, please feel free to give me some topic ideas and directions on how to allow it to have a better impact on all who read the posts, regardless of if they are regular readers, those who come from a link on another blog, a search engine, or through an act of serendipity. 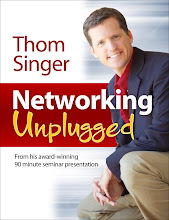 Email me at thom@thomsinger.com with your input. "66" has always been my lucky number. I was born in 1966. My parents house is just blocks off the Historic Route 66. My first car was a '66 Mustang (Dang, I loved that car!). My role number at my college fraternity was EB66. My home address has the number in it. And now this writing project is finding its way into my heart. Click Here to read more of the posts in this project. The Some Assembly Required Blog is again seeking guest bloggers. In my first year of blogging I had a feature called "Guest Blogger Friday"....and it is time to bring it back (although it is not just for Fridays anymore, these posts will appear whenever I feel like it!). If you have something you want to share about a related topic to networking, sales, business development, PR or marketing...now is your chance. Please keep it short (say it in 300 - 700 words). Also, I am looking for original material...NOT something you previously posted on your own blog! Regardless of the industry you work, someone is at the top. It might as well be you!!! There are few things that will help you achieve mind-share faster than doing good work. I have always stated that good networking skills cannot replace delivering a quality work product. It is not a contest between networking and hard work, you need visibility AND credibility. Talent will help spread the word to your prospective clients that you are the "Go-To" person in your field of expertise. But it is not enough. The mistake that many professionals make is that they think that having a good product or service will eliminate their need to network.....Or they think that having a strong network will cover up a weak product. NOPE. The two work hand in hand. You need to excel in your field of expertise or all the networking in the world will leave you as a fraud. Likewise you need to network or you are wasting your talent and leaving money on the table. This applies to any profession. For as long as I can remember the top morning radio show in Austin has been the ensemble cast of the JB and Sandy Show on Mix 94.7. These guys have been doing this show for over a decade, and along with their team, they entertain a large portion of the Austin community every day. They have achieved a balance between a quality product (the show is comparable to hanging out with old friends who are always willing to share a funny story) and having a local and national network that helps them continuously deliver the ratings. It is clear to the fans that JB and Sandy know that their success is dependent on more than just their celebrity. They are active in the local community and involved in a variety of worthy causes. 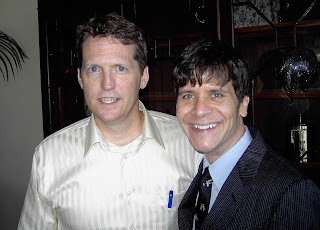 I had the pleasure to meet JB at the TEXCHANGE dinner this week (he is a friend of Tim Sanders), and he is the same nice guy one hears on the radio during the daily commute. So regardless of if you are a lawyer, banker, accountant, consultant or disk jockey....Dedicate the necessary time to properly know all that you can about your industry. Make sure clients and co-workers understand that you have the necessary training and experience to service their complex needs. Then be sure to execute on your promised outcome. And along the way... be nice to everyone. Sure, you will encounter some jerks, but don't let the bad guys get you down! In the end, word of mouth is fueled by a quality product or service and vice versa. Finding Your Way In The World Today Takes Everything You Got! Life is hard. We all long for the good old days, but if you could go back in time and ask my grandparents...life was hard a century ago, too. Humans have faced difficulties and adversities for as long as we have roamed this beautiful planet Earth. Today's challenges are different, and I do not want to argue the point of who had it easier (our grandparents or ourselves). Living in 2007 is not easy. There are so many uncertainties that cloud our world, that we can miss the wonderful parts of being. Confusion, fear, financial worries, social conflicts, and personal issues have the ability to take over our vision of reality. Many people just feel lost. I talked yesterday with a friend about his job. He has a great job with a Fortune 500 corporation. He has industry knowledge and experience, and he contributes to the success of his department. When I asked him about work, he just sighed. "Ohhhhhhh Hmmmmmmm, It's okay". There was not passion. Not a trace of "Umph!". he is just going through the career motions to support his children. He knows in his heart that he should be doing more with his life, but is trapped. I find this to be rampant in America. We were brought up to believe that we live in the land of opportunity. We were raised to believe that each of us has within us the seeds of greatness that can impact the future of mankind. I think all that optimism has left many people feeling underwhelmed with the life they find themselves leading. How disappointing to have the seeds of greatness, only to find that they never sprouted. The celebrity obsessed media constantly shows us images of the Hollywood rich and famous romping along all the nicest beaches and resorts on the planet. Those who know nothing of financial boundaries are plastered across television, magazines, websites and newspapers living unrealistic lives, that the rest of us must measure ourselves against. How unfair. I am on a path toward discovery. I have made it my mission to find my way in the world. That does not mean I have the map, instead I am still slashing my way about in the heavy brush looking for a trail that was left by someone before me on a similar journey. I know that sitting still will not lead me toward anything. I cannot bare the thought of just being stagnant. Even movement in the wrong direction can lead me toward salvation. Nobody can find their way alone. You need to have others to support you in your efforts, and still others who will hike along with you for a portion or all of your quest. This is why it is important to have a network. Your personal and professional networks are the ones who help you when you feel bewildered by life. One never knows whom might come along and show you the map, or a piece of the map, that leads you to greatness. If you feel that you too are lost, but searching for your way.....reach out to others. Admit to yourself and others that you are a seeker. You will encounter people who will enthusiastically guide you to the next station in your life....whatever that might be. When you see others who are looking....and you know the way....share it with them. While some will not welcome your seasoned advice, others will know that you have the experience and knowledge they desire. And how special it feels when someone tells you, as a new friend told me last week, "you came along at just the right time in my life". Wow. Thank you to my family and friends, without whom I would have no motivation to explore and seek. Thank you to all who have read my books. And Thank you to those who visit this blog, who comment, and who send me emails. Each of you share with me in my journey. Hang in there, we still have a long way to go. This tip is simple. Smile. I love to "people watch". Most individuals look very serious, pissed off, or overwhelmed when they are walking around in public. Few people smile. When you see another person with a smile on their face, it just makes you happy. I think that people like to see others happy, or they are at least intrigued by those who smile (wondering what they must know!). I was walking from the parking garage to my office building the other day, and thinking about something funny my five-year-old daughter had done the day before. As I passed a woman in the tunnel she commented that "Gosh, you sure look happy!!". We both laughed and continued on our separate ways. Now every time I see this woman in the building we say "hello". This familiarity we have developed has all grown from the smile on my face. Nobody wants to associate with others who are negative and grumpy. Even if you have personal issues that cause you to struggle, do not wear those problems on your sleeve. Instead, smile when you see other people. If nothing else it will make them smile back. I think that we all can agree that more smiles never hurt anyone! 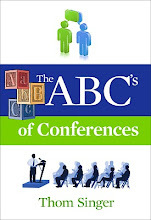 Mike Sigers at The Simplenomics Blog has a review of The ABC's of Networking. Mike writes a great blog that you should be familiar with, as it is always full of insightful thoughts and ideas about sales, marketing and general business. When most people think of networking they look toward the outside world. People often confuse networking with sales, and thus think it is only important for the sales professionals and c-level executives. Even those with the outward focused jobs will make this mistake, and only include customers, prospects and referral sources in their networking efforts. While networking will lead to sales success, if you only look at it in this manner, then you are missing the boat. You need to invest the time to get to know the people inside your company with the same gusto that you look to build relationships in the external business community. Those who work with you can be an amazing resources. You never know who in your life will be the person who can provide you with the next opportunity. There are many ways you can get to know those in your company, and there is no right or wrong methods. The point is to invest the time to make, grow and keep your business relationships, and this can only happen when you make the other people a priority. *Ask questions of those you work with to discover both personal and professional information. People want to feel important, and when you inquire about them, it shows that you are concerned with them. Many professionals get so wrapped up in their own lives that they fail to notice the people in their office unless they need them for something. Taking a few minutes on Monday to ask the receptionist about her weekend will not impact you productivity. If you really have an inflated view of your own self importance that you believe that a few moments of conversation with your co-workers is a waste of time, then YIKES!!! Get over yourself!!! *Plan or attend office events. I know, the emails about "Cake In The Break Room To Celebrate Mary's Birthday" might seem like they are intrusive, but Mary's birthday is important...to Mary!!! Joining a group to occasionally goes for happy hour is also a chance to bond with others. The summer family picnic may not be how your spouse wants to spend a Saturday afternoon, but too bad....you have to go! If you always fail to participate with your co-workers, you can rest assured that they will notice and feel separate from you at some level. Take the time to engage in activities with those at the office. It will come back to help you in the future. *Assist others in their jobs. Find ways to lighten the load of others if you can. Each of us has times in our jobs when we are overwhelmed. It is not fun to feel like the weight of the world is on your shoulders. When you see someone is swamped, ask them how you can help. In most cases just the acknowledgement that you recognize how hard they are working on a project will strengthen your relationship. *Share information. Too often people see their co-workers as competition. WRONG, you are all on the same team. If you discover some industry information or other valuable knowledge that can help them excel, forward it to them or take the time to otherwise educate the rest of your office. *Be approachable. Many people put off a vibe of superiority. Co-workers fear having to go into their office or running into them in the elevator. Don't be like this. Be open to getting to know those in your company and drop the facade that you are so tough. Unless you like being a jerk (oh, I know some of these people! ), then find ways to make it delightful for others to interact with you, even when dealing with difficult situations. *Have lunch with colleagues. You have to eat anyway, if you do not have plans with clients or prospects, invite a co-worker to grab a sandwich with you or eat with them in the break room. If you find yourself eating at your desk or alone at a restaurant more than once a month, you should make it a priority to change that habit. Meals are a great time to get to know people at a deeper level. The advantage to building stronger relationships within your company is that people will look out for you. Those who are distanced from co-workers often find them trying to undermine them. Offices where people have cultivated real friendships are more productive, have less office politics, and have less turn over. All good things. ***For all the lawyers and legal industry professionals who read this blog...this means that lawyers should eat with staff members, not just other attorneys!!! 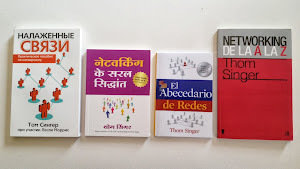 For more information of the topics of Networking and Business Development, please read my books!!! I was interviewed by Brian at Daxle.net for his new author series podcasts. Check it out and listen to the interview about the advice in my book "Some Assembly Required". Brian has just launched this interview series and he does a very professional job as a host. I look forward to hearing his future podcasts! Please go and listen. You can hear online or download it to your iPod (and listen to it again and again and again!!!). ****Since today is my birthday, buy yourself a gift. 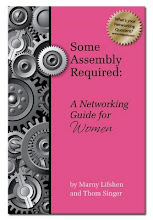 Visit Amazon.com and purchase Some Assembly Required and The ABC's of Networking. If you are slightly active in your local business community you will occasionally see people you know quoted or otherwise featured in your local Business Journal or other publications. Most often these news stories are quite positive and praise the individual for a business accomplishment, quote them as an expert in their industry, or they appear in a photo with other VIP's in your town. When they show up in the paper, you have a phenomenal opportunity to reach out and strengthen your relationship. Taking action at this moment is one of the most simple, yet POWERFUL things you can do to cultivate your connection with another person. Surprisingly almost nobody captures this opportunity. When someone attains their proverbial "15 minutes of fame", you need to do something to congratulate them or otherwise highlight that you saw them in the media. Appearing in print makes almost everyone feel good, but having others tell you they saw the article makes them feel GREAT. *You can call them or email them and let them know that you saw them in the paper or magazine. *You could clip the article and mail it them with a note congratulating them on being in the paper. *You might consider having the piece framed (if they are prominently featured) and present it to them in person the next time you see them. *You could scan it into a PDF and send it out to all your mutual friends with praise (while cc'ing the person). Do not be lured into the easy trap of teasing them about their being in the paper. Sometimes business professionals think they are being friendly by mocking people in a "good natured manner" about their media appearances. NOPE. Never do that. While some will laugh along, those that are not personally secure might feel awkward about your tone. They might downplay the importance of this exposure, but rest assured, most are happy as pie to see themselves in print. I have no scientific proof that LinkedIn is having a huge membership surge. I have not read any articles, done any research or channelled the spirits of networking gurus of days past. But something is happening with the worlds most popular online business social networking mega website. I know this because in the last two weeks I have been overrun with more than a dozen invitations to join people's networks. In many of these cases the people are new to LinkedIn. Networking is alive and well, both online and in the real world!!! As of today, I have 144 contacts on the site. Granted, I know many more people, but I do not instigate connections in LinkedIn. Of those who I am connected with, I have probably invited five. Since joining the service in December 2003 I have never been an active linker. But I do welcome invites by others. I do have one rule....I must actually know the person. With few exceptions, I have sat down and had coffee, lunch or a beer....in person....with everyone in my network. To link to people that one does not really have a meaningful relationship deludes the value of the LinkedIn service. I do have some virtual friends I have met through blogging, but have had many email conversations with them before accepting their request to link. When I speak to groups around the country about the power of having a network, the number one question I get during Q&A is about the online social networking sights. Some are huge fans who link to anyone and everyone.....others are skeptical. My belief is that these sights are useful tools for everyone, but that they cannot replace in-person human interaction. I often get emails from people whom I have never met or who heard my networking seminar presentation, but did not speak with me directly. I decline these connections (sorry). I think that more people are realizing that having connections and cultivating those connections are an important tool for their own success, and thus they are discovering the tools necessary to become better at business relationships. My friend Cheryl Miller of RR Donnelley was the hostess of the Book Launch Party for my recently released book The ABC's of Networking. A great time was had by all at The Tap Room at Six Lounge in Austin, Texas. I am grateful to all my friends and professional colleagues who came to celebrate the fun of the new book!!! Photos are below of a few of those who joined us for the party. 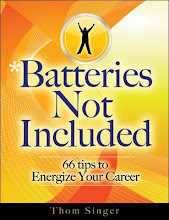 If you have not yet purchased a copy of the book, you can do so at Amazon.com. Thanks to all who attended!!!! Not everyone makes their connections with other people a priority. While I disagree with folks who are dismissive of others, it is not a crime. Therefore, if you do value the importance of cultivating relationships, you will need to do more than the next guy to make, keep and grow your business relationships. At the same time, you can only do so much. Often you will encounter a person whom you expect could be a good contact, and yet they will never call you back. When you see them at a business event they appear genuine in their excitement to see you....and eagerly suggest that you get together for coffee. However, they are slow to return calls. When you do schedule a rendez-vous, they are fast to cancel on you at the last minute. Hmmmmmm. When you reach the end of your rope with someone like this, I suggest that you reach out one more time. If you really feel that you have done all you can to try to make a connection, but the other person is not receptive, then you make a final effort to get their attention. One last call, email, text message or send up smoke signals. If they still do not respond, then just move forget about them. Not everyone you meet is destined to become part of your network of professional contacts. I have a business acquaintance whom canceled on me three times in a row, each time giving me a very long explanation about the amazing people with whom he is doing business, and explaining how busy he was with these important VIP's. The facts were clear, I was not a priority. Rather than getting angry, I decided to give it one more effort. I called him and we did schedule coffee for a week later. Again, he rescheduled.... but this time I expected his anti-social behavior, so I was not angry. I simply have not called him to schedule another meeting. I decided not to take his actions personally, but I do not need to have him in my network. I ran into him last week at a business seminar and he again excitedly wanted to schedule a time to meet. I told him that I would welcome it after my upcoming vacation. If he calls me in July I will be happy to actually see him, but I will not make the effort again to instigate the contact. There are many others whom could become my clients, prospects, referral sources and friends. I suggest you only invest your time where it is mutually beneficial. Always give that last effort and reach out for a final time...but don't tell them that they are on notice. Giving an ultimatum is never useful in a business networking situation. Simply and calmly make a mental note that this is their last chance. If they fail to come through, chalk it up as a lesson learned about the other person's character. Then forget about it. When you see them in the future, be polite. If they are truly interested in building a connection, they will work hard to garner your attention. If not, they never cared much about you anyway. The other day I recieved an email from someone who wanted to introduce me to their publishing company and the services they provide to authors trying to promote their books. 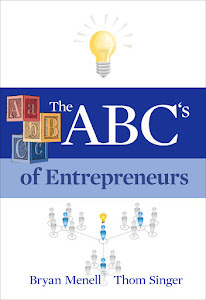 I am always excited to find new ways to get the word out about "Some Assembly Required" and "The ABC's of Networking", and continuously search for new and creative ideas (especially when they are "bootstrap" ideas, or mutually beneficial partnerships!!!). This email, however was addressed "Dear Tim". Additionally later it referred to "Tom Singer's books". Since my name is Thom Singer....and they had gone so far as to personalize the email, it was disappointing that they did not have it correct. I have some friends who were invited to a wedding of some old friends. The beautiful engraved invitation was formally addressed to Donald and Laura Mooney. The bad part was that the wife's name was not Laura. In fact, Laura was the name of Don's ex-girlfriend. Ouch. Another friend got a beautiful blanket from a co-worker when his son Brandon was born. The bad news was that the embroidery spelled out the name Brendan. Bummer...the baby never got to use this blankie. If you are going to reach out to someone, be sure that you have their name right. Some people have odd spellings of common names (aka: THOM), so be sure to do your research and find out how they prefer to be addressed. My dad has an odd first name, Olvin, so he has gone by "Al" his whole life. He always knows when someone he does not know well is calling, as they try to use his given name or some other version of a possible nickname. I deleted this email from the publisher, as it was clearly SPAM. I could not take anything else they said as very serious after they made two mistakes with my name. Do not get dismissed because you messed up their name!!! Take the time to get their name right! 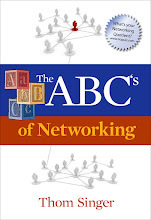 If you are interested in reading a review of The ABC's of Networking before you purchase a copy, please click here. Thanks. It is common for business people to miss great networking connections when they attend business events because they do not have memorable conversations. People mistakenly think that the attending the gathering and "schmoozing" is networking. WRONG! It is just meeting people. One conversation DOES NOT MAKE SOMEONE PART OF YOUR NETWORK. Real networking is about the follow up over following months or years. So if the event itself is not networking, what is it? The business conference, cocktail party, luncheon, seminar or other gathering is just a tool to bring people together. It allows you an easy and relaxed atmosphere to have conversations. Communication with others common. We encounter dozens of people everyday in all sorts of situations: At Starbucks, the dry cleaner, in Whole Foods, at sporting events, on airplanes, etc... The problem is that we meet so many people, that few stand out in our minds. We just forget them as soon as we walk away. The same is true in business. Most of the people you meet do not remember you the next day. I know, nobody likes to think that they are just a "Plain Jane" (sorry to anyone named Jane)....as most of us think highly about ourselves and our own situations, we forget that we are simply not that important to others. However, once you accept the fact that you are not automatically memorable, you can find ways to make your interactions with others stand out from the crowd. 1. Ask questions. Because people are usually more concerned with their own life, career, family and personal interests....they will find the conversation more memorable if you talk about them. Develop a series of questions that you can ask people that will lead them to tell you their story. In the city I live (Austin, Texas), more than half of the business professionals have moved here over the past 15 years (yes, the city has doubled in size!). In fact, it doubled again the previous 15 years, which means that it is rare to find someone who was born in Austin. A great question is "How long have you lived in Austin?". This can then lead to more questions about where they came from, what college they attended, etc... It is very easy to start a conversation where the other person will share their whole life story, all stemming from one question. 2. Stay informed on current affairs. While you do not want to talk about religion, politics, or any other controversial topic with those you just met, you do need to be sure that you are up on the current news stories. Often the media will hype celebrities or other pop-culture topics that you might not feel are important. But if they are in the news, you should be aware of them. I recommend that you get your news from a variety of sources, so that you have a good mix of all the topics that are being discussed by folks. Newspapers, cable news, the internet, radio, etc... I also suggest that you skim People magazine (or something similar) when you are in the check out line of the grocery store. I could care less that Paris Hilton is going to jail, but it is important to know the basics of the story. I realize that it takes time, but you don't want to appear that you only focus on business or sports if a popular culture topic comes up in a conversation. 3. Explain your business. Have a short and upbeat way to describe what you do when the discussion does move toward you. Be able to explain your job to others in just a couple of sentences. Make sure that your excitement comes through. If you just say "I sell insurance" you will be forgotten. However, if you respond with "I love my job because I sell insurance that helps families have peace of mind", that might warrant a few brain cells to recall you in the future. 4. Follow up. Be the person who follows up with those you meet. Do not wait for the other person to remember you, put yourself back in front of them within a few days of your initial conversation. Send an email, call them on the phone or mail a handwritten note. By tactfully reminding them about your meeting, you make yourself more memorable for both the short term and the long term. If you wait for them to contact you or for the next time you bump into eachother, you will be forgotten.